When a company chooses to have one process of its business developed by another company, this is called Outsourcing. At Cualit we considered it was time to present our understanding of a concept that can help companies expand and become more competitive in new markets. It benefits the ability of the company to develop certain activities in which it has no specialization, allowing to delegate such development in specialized organizations. Time investment reduced (selection process, induction) and costs to hire trained staff. Reduces time investment on implementation and costs of development of new areas. It is a worldwide trend that is in constant growth. With it, the number of companies emerging offering specialized services is also increasing, with better performance at a lower cost. Increase the flexibility of the organization and decrease its fixed costs. It benefits the ability to focus on the core function of the business and delegate what is secondary in a company specialist. Allows the company to own the latest technology without need to train staff for that. It allows the company to respond quickly to changes of the market. Increase in the strengths of the company. Assume that cultural and time zone differences may exist when hiring services of a foreign company. 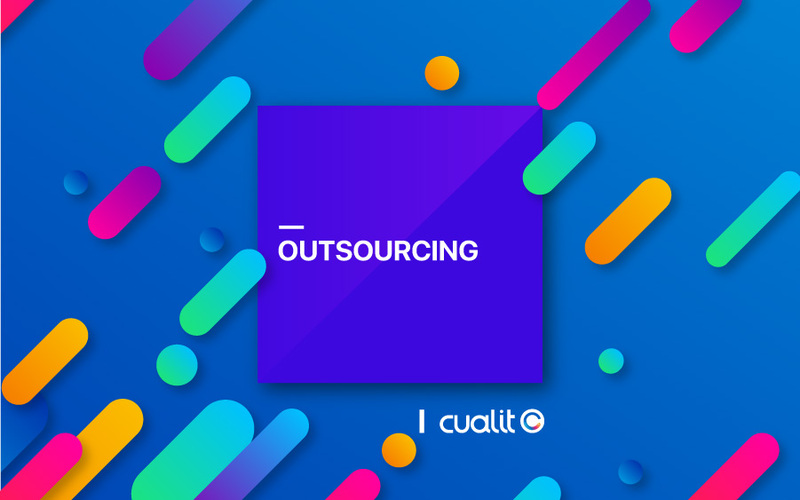 At Cualit, Outsourcing is a concept we are very familiar with. National and International companies outsource their work with us in different areas of specialization: Technology, Design, Digital Marketing, DevOps and more. To provide a service of excellent quality, is that we adopt an agile work methodology that prioritizes maintaining constant communication with the client. Our commitment is to take responsibility for the work as part of the client’s company. Their vision is our mission.